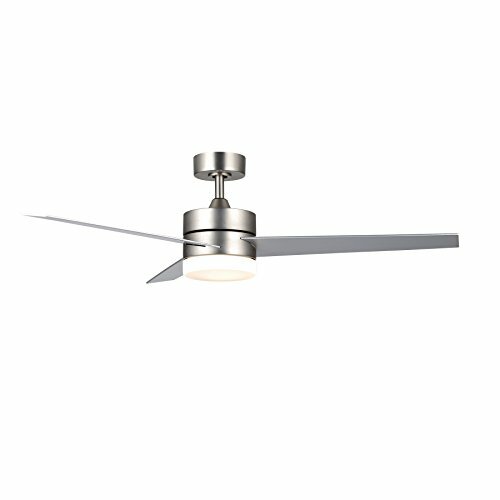 UL LISTED, SAFETY & DURABILITY, UL certificated for superior quality & safety; 0.75" down-rod holds the fan light securely; steel fan body in brushed nickel ensures rust-free performance even after years of service; 3 plywood blades add luxury to your space. QUIET MOTOR & REVERSIBLE FAN DIRECTION, 70W carbon steel AC motor with 3 speed options (high/middle/low) produces almost unnoticeable noise; reversible dual-direction fan improves air circulation to keep you warm in winter and cool in summer. WHITE GLASS SHADE, high light transmitting white glass shade with 18W (3000K) LED panel light (INCLUDED) inside softens radiations and delivers flicker-free lights. REMOTE CONTROL & ADJUSTABLE HANGING HEIGHT FOR CONVENIENCE, control fan speed, direction, work time and light & fan on/off via the portable remote control (10 ft. effective range, INCLUDED); 54" lead chains allow you to adjust hanging height according to needs. WARRANTY, backed by a 1-year warranty for worry-free shopping experiences; free exchange if the product is defective. ROYAL PEARL Modern Square Led Chandelier Adjustable Hanging Light Three Ring Collection Contemporary Ceiling Pendant Light H47" X L32" x W32"